The K104M-R mates with either the K100 Bead or the K100B Hermetic Bead. Anritsu has three different Stress Relief Contacts available. ("Sliding Contacts") All these contacts provide protection to the connection in the event of temperature changes, shock or vibration. 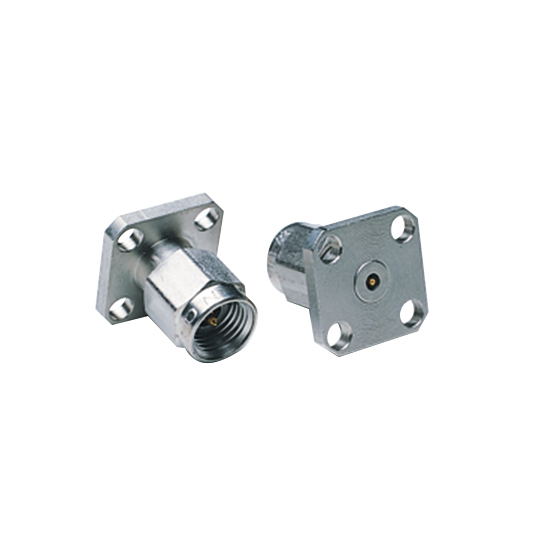 The K110-1 is used for microstrip and Coplanar waveguide with 0.15 mm trace widths. The K110-2 is used for stripline with 0.41 mm trace widths. The K110-3 is used for microstrip with 0.41 mm traces. Several tools are used to manually install the bead and connector. Use the 01-106 soldering fixture to properly position the bead in a housing before soldering. This tool also is used with the K103F, K103M,and the K104F. Use the 01-104 Drill & Tap Set to simplify the job of drilling the required concentric holes in the housing; it is used when NOT using Stress Relief Contacts. Use the 01-108 Drill & Tap Set for the same purpose when Stress Relief Contacts are used. The K104M-R is RoHS compliant. It contains less than the Maximum Concentration Values (MCVs) for Lead, Mercury, Cadmium, Hexavalent Chromium, PBB and PBDE per EU directive 2002/95/EC. The following RoHS exemption applies: Lead as an alloying element in copper containing up to 4% (40000PPM) lead by weight.